Friction-spinning is an incremental forming process, which is accompanied by complex thermal and mechanical loads in the tool and the formed part. To influence the process temperature, two main process parameters, i.e. the rotation speed and the feed rate, can be adapted. 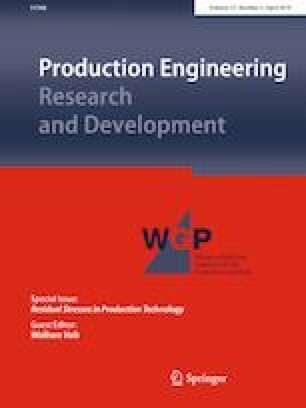 With the objective to improve the tool performance and the quality of the workpiece, this study focuses on a coating concept for friction-spinning tools made of high speed steel (HS6-5-2C, 1.3343). Atmospheric plasma sprayed (APS) Al2O3 and ZrO2-8Y2O3 coatings serve as a thermal insulator, while physically vapor deposited (PVD) Ti16.7Al21.8Si7.9N and Cr18.7Al22.2Si7.5N films are applied to increase the hardness of the tools. In addition, duplex coatings, combining the APS and PVD technique, are synthesized to influence both the heat transfer and the tribological properties of friction-spinning tools. Subsequently, all coated tools are tested in a friction-spinning process to form flanges made of AW-6060 (AlMgSi—3.3206) tube materials. The tool temperatures are determined in situ to investigate the impact of the tool coating on the process temperature. Compared to an uncoated tool, the alumina and zirconia coatings contribute to a reduction of the tool temperature by up to half, while the PVD films increase the hardness of the tool by 20 GPa. Furthermore, it is shown that the surface quality of thermally sprayed or PVD coated tools is directly related to the surface roughness of the resulting workpiece. The authors thank the German Research Foundation (DFG) within the cooperation project TI 343/122-1 and HO 2356/11-1 “Production and application of graded coating microstructures for the process of friction-spinning using PVD and thermal spray technology” for their financial support.